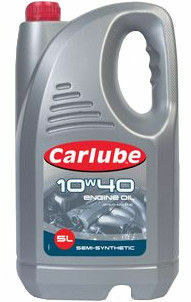 Carlube 10W-40 Semi Synthetic 10 W 40 Motor Engine Oil 5Liter XAJ050. Carlube 10W40 Semi Synthetic Engine Oil is a high specification oil suitable for use with turbo-chargers in diesel and petrol engines. It can also be used with multi-valve fuel injected and multi-cam engines.